It’s Prime time. Efficiency has no limits. Entune™ Premium Audio with Integrated Navigation and App Suite — Includes: Entune™ Multimedia Bundle (7-in. high-resolution touch-screen with split-screen display, AM/FM CD player, six speakers, auxiliary audio jack, USB 2.0 port with iPod® connectivity and control, advanced voice recognition, hands-free phone capability, phone book access and music streaming via Bluetooth® wireless technology), Siri® Eyes Free, Entune® App Suite, HD Radio™ Technology, HD Radio™ Predictive Traffic and Doppler Weather overlay, AM/FM cache radio, SiriusXM® Satellite Radio with 3-month complimentary SiriusXM All Access trial, Gracenote® album cover art and integrated backup camera display. Access to Entune® App Suite is subscription-free. See toyota.com/entune for details. Entune® App Suite — Includes: Destination Search, iHeartRadio, MovieTickets.com, OpenTable,® Pandora,® Facebook Places, Yelp® and Slacker Radio; real-time info including traffic, weather, fuel prices, sports and stocks. Access to Entune® App Suite is subscription-free. See toyota.com/entune for details. 4.2-in. color dual Multi-Information Display (MID) with customizable screens including Energy Monitor, Hybrid System Indicator and Eco Score, Eco Savings Record, Drive Monitor, Eco Diary, climate control, driver support systems, audio system content, and navigation system content. Entune™ Premium Audio with Integrated Navigation and App Suite — Includes: Entune™ Multimedia Bundle (11.6-in. HD multimedia display, MP3/WMA playback capability, six speakers, auxiliary audio jack, USB 2.0 port with iPod® connectivity and control, advanced voice recognition, hands-free phone capability, phone book access and music streaming via Bluetooth® wireless technology), Siri® Eyes Free, Entune® App Suite, HD Radio™ Technology, HD Radio™ Predictive Traffic and Doppler Weather overlay, AM/FM cache radio, SiriusXM® Satellite Radio with 3-month complimentary SiriusXM All Access trial, Gracenote® album cover art, Charging Station Map and integrated backup camera display. Access to Entune® App Suite is subscription-free. See toyota.com/entune for details. Entune™ Premium JBL® Audio with Integrated Navigation, App Suite and Prime Apps — Includes: Entune™ Multimedia Bundle (11.6-in. HD multimedia display, AM/FM, MP3/WMA playback capability, ten JBL® GreenEdge™ speakers, auxiliary audio jack, USB 2.0 port with iPod® connectivity and control, advanced voice recognition, hands-free phone capability, phone book access and music streaming via Bluetooth® wireless technology), Siri® Eyes Free, Entune® App Suite, HD Radio™ Technology, HD Radio™ Predictive Traffic and Doppler Weather overlay, AM/FM cache radio, SiriusXM® Satellite Radio with 3-month complimentary SiriusXM All Access trial, Gracenote® album cover art, integrated backup camera display and Prime apps (Remote Charge Management, Charging Station Map, ECO Dashboard, Remote Climate and Vehicle Finder) with 3-year complimentary trial. Access to Entune® App Suite is subscription free. See toyota.com/entune for details. Access to Prime apps requires an active Safety Connect® subscription after the 3-year complimentary trial. See toyota.com/safety-connect for details. Safety Connect® — Includes: Emergency Assistance, Stolen Vehicle Locator, Roadside Assistance and Automatic Collision Notification. Available by subscription. (Complimentary 3-year trial subscription.) See toyota.com/safety-connect for details. The power of using less to get more. Prius Prime features a Toyota-first dual motor drive system that uses both motors to propel Prime. The result is a boost in acceleration feel, improved efficiency and the added benefit of EV Mode at full highway speeds. It helps deliver an exhilarating experience and makes the drive toward tomorrow even more exciting. More efficiency. More potential. Every last detail of Prius Prime has been optimized to help make it the most advanced – and efficient – Prius yet. 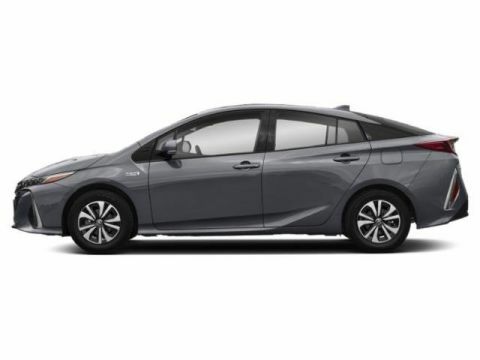 Cutting-edge, lightweight materials, proven hybrid technology and an optimized Plug-in Hybrid Vehicle (PHV) system all work together to help Prius Prime reach an impressive, class-leading EPA-estimated 133 MPGe2 3. Prime continues to raise the efficiency bar with a class-leading EPA-estimated total driving range of 640 miles4 3 to help you challenge what’s possible. 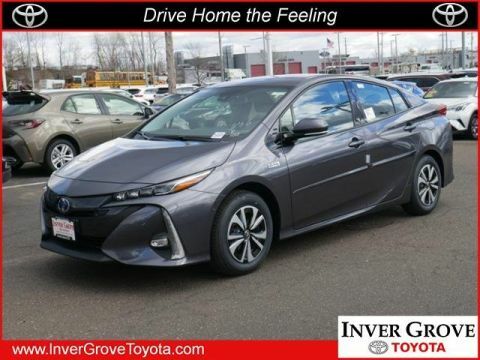 Reaching these outstanding ratings is easy with Toyota’s legendary hybrid technology that invites you to do even more. This available intelligent technology, called Predictive Efficient Drive5, helps boost fuel efficiency by learning your routine stopping patterns. When approaching a recorded stop, an icon will display on the map of the navigation system and suggest the optimal time to release the accelerator. Regenerative braking also activates sooner to recover more energy for the hybrid battery. No detail is too small as Prime’s rear hatch is made of strong yet lightweight carbon-fiber-reinforced polymer, a first for Toyota. This material allows for advanced performance, and makes opening and closing the hatch effortless. Advanced materials like these help increase efficiency and elevate your drive. Prime offers three driving modes so that the driver stays in control: EV Auto Mode6, EV Mode7 and HV Mode. EV Auto Mode intelligently selects between EV and hybrid driving based on demand and driving conditions to optimize your efficiency. EV Mode relies on EV driving to maximize efficiency, all the way up to full highway speeds. HV Mode efficiently combines the gas engine and EV power from the HV battery to drive prime. 3Based on fueleconomy.gov non-luxury plug-in hybrids, as of September 2016. Actual mileage will vary. 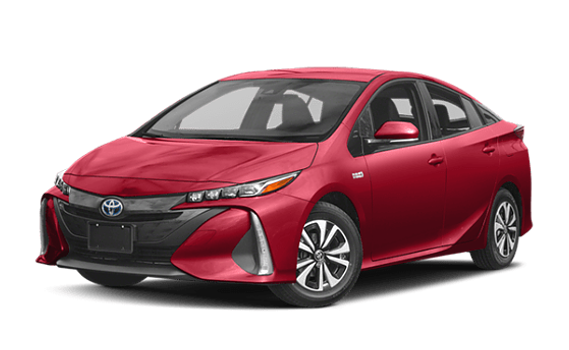 42017 Prius Prime EPA-estimated range rating when fully charged and with a full tank of gas. Excludes driving conditions. Actual mileage will vary. 5Be sure to obey traffic regulations and maintain awareness of road and traffic conditions at all times. Effectiveness depends on many factors. Depending on the conditions of roads, vehicles, weather, etc., Predictive Efficient Drive may not work as intended. See Owner’s Manual for details. 6EV Auto Mode requires some level of charge to activate EV drive, and will trigger the engine as the battery drains, especially when accelerating. There are limited driving conditions—largely due to climate and temperature—that may require EV Auto Mode to turn off. See Owner’s Manual for details. 7CAUTION! 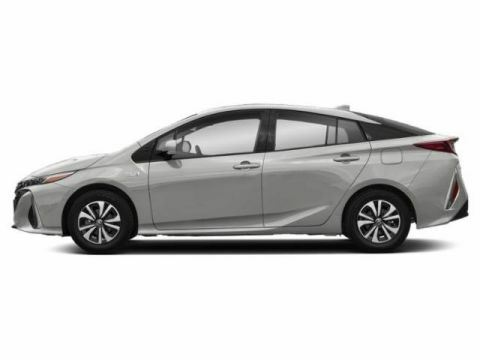 When driving a hybrid vehicle, pay special attention to the area around the vehicle. Because there is little vehicle noise in EV Mode, pedestrians, people riding bicycles or other people and vehicles in the area may not be aware of the vehicle starting off or approaching them, so take extra care while driving. Prime’s EV Mode has an EPA-estimated driving range of 25 miles, allowing it to work under certain conditions at full highway speeds. EV Mode range will vary and is dependent upon many factors, including charging practice, driving style, road/traffic conditions, outside temperature, air conditioning control levels, payload/cargo weight, proper tire pressure, vehicle maintenance and battery age. Battery capacity will decrease with time and use. See Owner’s Manual for details. Prius Prime makes charging at home simple and more convenient than ever. In fact, there’s no need for special equipment – the charging cable is included, and it takes less than five-and-a-half hours to get a full charge using a standard household outlet8 9. And charge scheduling allows you to schedule your charge in advance, allowing you to take advantage of off-peak electricity rates. You can forget about range anxiety – when your battery is low, and with gas in your tank10, Prime can reliably get you where you’re going with its proven gas hybrid engine. 8Charge time is for standard 120V outlet. Always plug-in in accordance with Owner’s Manual. 9A heavier-duty wall receptacle with GFCI (Ground-Fault Circuit Interrupter) and a dedicated circuit are recommended but not required. 10Never let Prius Prime run out of gas. 11Requires active subscription to Safety Connect ® and download of Entune ® App Suite to compatible smartphone. 12The Smart Key System may interfere with some pacemakers or cardiac defibrillators. If you have one of these medical devices, please talk to your doctor to see if you should deactivate this system. Take control and use your smartphone with the available Prime apps,13 including the Remote Climate app.14 This way, you can check your Prime’s current temperature setting and change it to your liking – all before you even get in. When Prime is plugged in, the power used for the Remote Climate is pulled straight from the grid so your battery keeps its charge. Now your comfort is always within reach. Tap into convenience. The available Prius Prime apps13 give you direct access to your Prime from anywhere. They make it easy to schedule a charge, adjust the climate control, look for a charging station, locate your vehicle, and much more – all through your smartphone. As you park, available Intelligent Clearance Sonar (ICS)15 is designed to scan for stationary objects like walls or posts that are within close proximity. If Prime anticipates a collision, an audible and visual alert will politely notify you, engine or motor output will slow down, and if needed, brakes will automatically be applied to help bring Prime to a halt. Available Intelligent Parking Assist (IPA)16 helps you navigate and conquer those difficult parking situations. Prime will automatically control the steering wheel, while you control the gas and brake, and help guide you into an open parking space. 13Requires active subscription to Safety Connect ® and download of Entune ® App Suite to compatible smartphone. 14Maximum operation duration of this system is ten minutes. System may not operate if the hybrid battery is under load or if the battery charge is low. While plugged in, this system operates using power from grid. See your Owner’s Manual for further information. 15Intelligent Clearance Sonar (ICS) is designed to assist drivers in avoiding potential collisions at speeds of 9 mph or less. Certain vehicle and environmental factors, including an object’s shape and composition, may affect the ability of the ICS to detect it. Always look around outside the vehicle and use mirrors to confirm clearance. See your Owner’s Manual for further information. 16The Intelligent Parking Assist system requires driver brake control. Always look around outside the vehicle and use mirrors to confirm clearance.